Has your dining room gotten stale? Our new glass plate collection is the perfect way to glam it all up! Our traditional round dinner plate is now available to buy in a set of 4! Each plate is 10" in diameter and is the perfect size for lunch, dinner, or even just an extra large dessert. Design each plate individually. 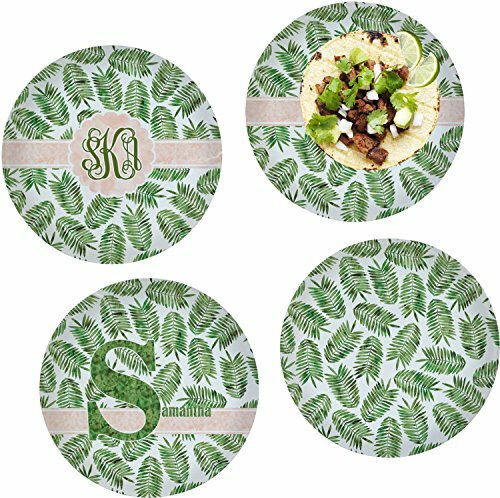 With a huge catalog of designs and patterns, these plates are completely customizable. Feeling extra hungry? Choose a foodie design, sprinkled with apples, lemons, or even coffee. Of course, you always have the option to go classic with stripes or plaid. Have a monogram on one, a name on another, and initials on the rest. It's entirely up to you! Dishwasher safe, these plates are beautiful and highly practical. A wonderful wedding gift for young newlyweds; customize with their new married name! If you love a little bit of nature's greenery, this is the design for you! This design has a touch of nature with a beautiful feminine style. The background of the main design is filled with thin tropical leaves scattered about. The leaves are filled with a dark green watercolor texture. The ribbon and scalloped frame are filled with a light peach watercolor texture. The monogram in the middle gives an extra feminine touch to this design. The coordinating design has the same leafy background and peach ribbon. In place of the framed monogram, there is a large initial and name filled with a dark green watercolor texture.